Every election season there are high and low profile races and sometimes it’s the races that haven’t captured the public’s attention that will have the greatest impact. Don Sarro My name is Don Sarro and I am a member of AFT Local 1605. My campaign for Volusia County School Board began in earnest after learning the basics of running a campaign at the Farm Team training. General Information • WDRRWF • Who Does Rick Really Work For? 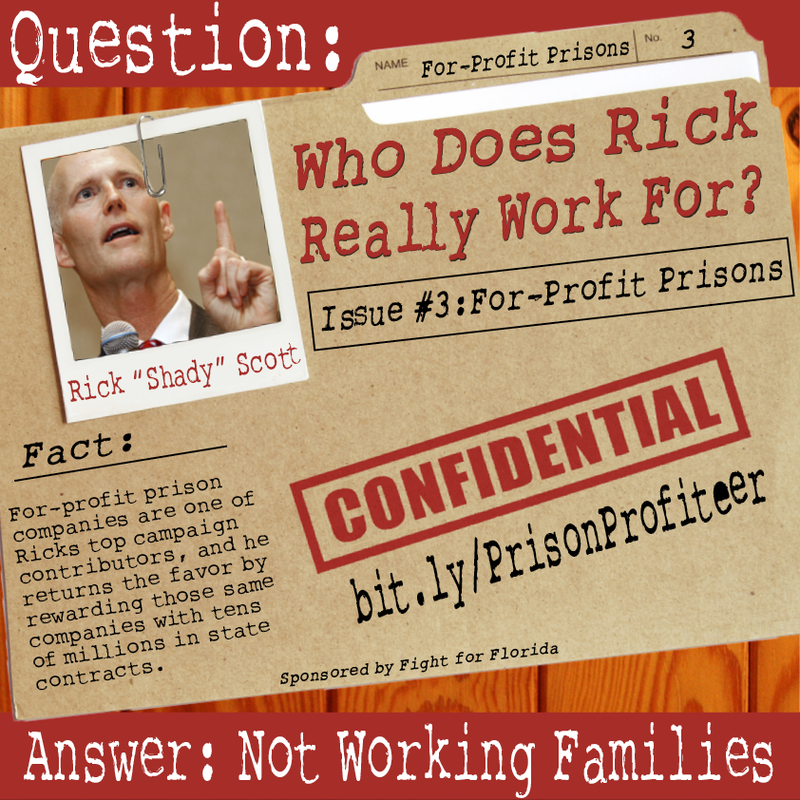 Governor Scott has made Florida a haven for unscrupulous companies all in the guise of making Florida “business friendly”. It’s probably no surprise that the industries that have provided the bulk of Scott’s job recovery numbers (restaurant and lodging, retail and tourism) also pay the lowest wages, have the fewest benefits and are filled with employers who steal from their employees. Powered by over 10,000 volunteers, United for Care has been connecting face-to-face with individuals all across our state. The success of our grassroots campaign can be seen in our internal polls, some of which he have been released to the press, that have consistently shown high levels of support for Amendment 2 since it was placed on the ballot. I have a strong desire to serve and make the right changes for my community but campaigning for political office is new to me. “When I hear a politician say that we have to raise the minimum wage so working families can make ends meet, I cringe…” – Governor Rick Scott Rick Scott’s Economy Scott Maxwell, of the Orlando Sentinel, put it quite plainly when he wrote, “If you’re still arguing that lowering corporate-tax rates and increasing corporate handouts is a formula for success, you’re delusional….Incentives are also, of course, inherently unfair. My name is Scott Stiltner and I am running for a seat on the Port Orange City Council. My experience with the Farm Team staff has been absolutely amazing. General Information • Who Does Rick Really Work For? The race for Florida’s governor is heating up and Rick Scott’s campaign is continuing to dump millions of dollars to try and rebrand the Big Business Governor as the champion of jobs and lowering unemployment for Florida’s Working Families. AFL-CIO NOW Blog, by Kenneth Quinnell It’s an election year and we are quickly approaching the time when working families will have the opportunity to go to the polls and vote against a whole host of extreme candidates who support policies that limit rights, make it even harder to afford a middle class life and pad the pockets of their corporate buddies. Dan Oliver, Labor Farm Team Candidate Hernando County Commission District 4 Dan is a member of Teamsters local 79 and has lived and worked in Hernando County for the last 25 years.